The following individuals have made tax-deductible contributions to VA Pride. Thank you for the support - you make us proud! Tara Casey: "Love is Love is Love"
Mary Gentry: "In honor of the entire LGBTQ community <3 LOVE YOU"
Neal Beets: "In memory of Robert Mahone"
Linda Newsom-McCurdy: "In Honor of James Millner for his 45th Birthday XOXO Linda & Lori"
Michelle Nuckols: "In honor of my awesome brother Austin Nuckols, who lives in NYC"
Anonymous: "In Honor of Belle and James"
Emily Haynes McGee: "In Honor of Andre"
Kate Boland: "In Honor of Kate and Tracey"
Brandon Horton: "Truth ir dare challenge"
Vivian Junco: "In honor of Tio Mario & Tio Marvin and Franco & Peter"
Thank you for supporting Virginia's LGBTQ+ community! Please click below to make a tax-deductible donation to Virginia Pride! Virginia Pride's year-round activities strengthen the LGBTQ+ community, and our annual PrideFest is the largest LGBTQ+ event in the history of the Commonwealth, connecting the community with peers, resources, organizations, and supportive businesses. Your name and donation level will be recognized on the website (there is an opt-out option if you wish to remain anonymous). VA Pride has almost no overhead! With no paid employees or leased office space, Virginia Pride donations have an unusually strong direct impact on mission fulfillment. 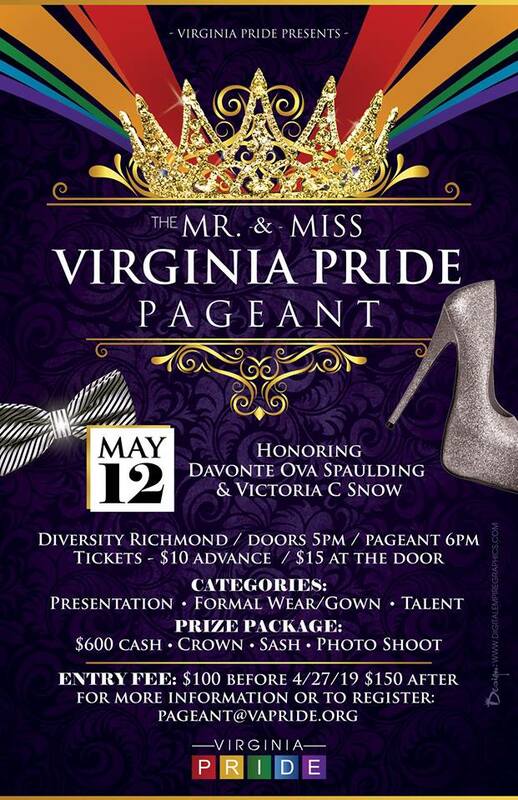 Virginia Pride (Gay Pride Virginia, Inc.) is a 100% volunteer-run, IRS-recognized 501(c)3 nonprofit organization. Your contribution is tax-deductible under the fullest extent of the law. No goods or services are provided in exchange for your contribution, other than the satisfaction of knowing you chipping in to support the LGBTQ+ community of the Commonwealth. You can pay your pageant entry fee by clicking below.